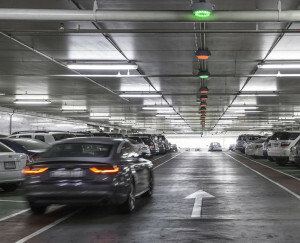 Park Assist Indicators – Has your corporation or business complex reached capacity in your parking garage, or surface lot? Is HR seeing work ethic and moral drop due to inefficient parking conditions? Are your tenants complaining about parking limitations? Upset employees or tenants alone will prove a negative impact on your company productivity. The need to find a solution for your booming company or business complex success, and need for new talent in order to support your growth will pend on where you will park them. Doesn’t sound like an issue until you have talent that chooses to go home after frustration overcomes them at 9am when they can’t find parking. Or they return from lunch with nowhere to park. Projects on their desk that need attentions, dead lines to meet before the end of day…..you see how this impacts performance. Since 2015 as the US economy climbed another rung to find it’s way back to a stable state of employment, a parking epidemic for growing corporations has exploded in major cities and dense metropolitan areas. Structural room exists within facilities for expanding talent base, but a lack of affordable real estate footprint for new parking lots becomes the hindering affect. What about car pooling, shuttling, and split shifts? All viable options, but not a solution to support a robust growing company that relies on the performance and happiness of their talent. The solution? Park Assist. Simple, efficient, no hardware or software needed, can be adapted, removed, and re-implemented at any point, and pending your existing parking lot or garage layout SVS Parking will align daily systems that will increase your parking density by 30-50%, restore talent work moral, and provide a person touch to your company talents work day. Our systems have been tested and proved among local fortune 500 companies. How? Parking lot or parking garage dimensions are taken to assure ample parking isle room is available to park-assist/rack strategic lanes of vehicles. Pending SVS Parking findings schematics are completed to assure supportive parking density can be achieved. From here pre planning assures employee awareness and facility administration communications. Once park-assist systems are launched a park assist team is placed on the top level or your parking garage, or area of your surface lot that per traffic patterns is the area last to be fully parked. Signage and natural traffic flow guides overflow traffic to these areas. First impact – Once your parking garage or surface lot becomes full the park assist team begins directing “overflow” employee (talent) vehicles into park-assist lanes. These lanes are positioned/racked perpendicular with existing self parking vehicles/spaces. As each garage ramp, or lot isle become full on one side, park assist operation teams continue adapting down to the next level lower (or isle over for surface lots) to direct traffic into additional park-assist lanes. Select parking garages and lots can find plans for dual park-assist lanes; further increasing parking density. Revolving – As company talent departs for lunch, and or shift end, new parking spaces organically open. These newly open spaces are taken by the park assist team by moving a park-assisted vehicle and placing it in a permanent parking space. Each vehicle is then marked, and keys are locked safely in a remote level parking podium with attendant. Your company talent is informed/reminded upon arrival to return to a specific level for their keys at the end of their day. End of Day – Your company talent completes their work day, returns to the level or lot location indicated by their park assist attendant(s), and is delivered their keys. In some programs a hospitality plug-in can be added in order for employees to have their vehicles delivered to them on curb-front or a designated pick up station. ← Valet Parking Epidemic – Really?